When you are consistently ranked as the top fast food restaurant, year after year, how do you improve? This is the challenge faced by Chick-fil-A. The answer – embrace technology to enhance the customer experience! If you are a Chick-fil-A fan, you have surely noticed the increasing number of customers who are using the restaurant’s mobile app to order (and pay for) food in advance, allowing them to quickly stop in (or drive thru) to pick up their orders. Or you may have noticed the efficiency by which staff uses mobile technology to take orders to speed you through the drive-thru process. 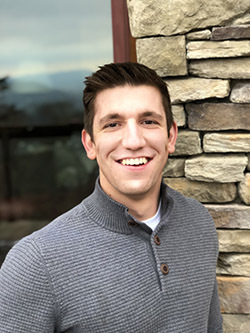 As you marvel at Chick-fil-A’s speed and efficiency, one of the people you can thank is NC State alum, Eric Davidson (BS CSC ’17), a Software Development Engineer working at Chick-fil-A’s corporate office in Atlanta. Eric and his Quality Engineering team are working on over 30 projects designed to improve the customer experience through efficiency and quality, each with their own unique automation barriers. Two of these projects, the Point of Sale systems and the mobile application, are most recognizable to the average customer. Davidson is impressed with the company’s roots in technology. Out of the team’s many projects, the mobile application as well as the Point of Sale (POS) system have a direct impact on the customer on a day-to-day basis. The application allows members to place orders from their devices and earn points for every purchase to redeem rewards of their choice. The POS system is a combination of software and hardware that Chick-fil-A uses to make transactions and simplify business operations. His work with both the app and their POS system focuses on functionality and efficiency to ensure consumers have unparalleled service. Not surprisingly, Davidson’s team’s work has paid off since his start at the company. Davidson’s interest in computer science was spurred by a high school class that caused him to fall in love with the problem-solving aspect of the discipline. He credits much of his success at Chick-fil-A to his computer science education at NC State.